Today's first featured photo is, of course, this morning's view from one of the living room windows of my home. Seasons change and so do points of view. 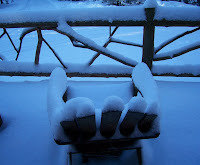 Porch time has passed and it looks like time to bring in the chairs. No matter, from the porch or the window, this view will melt your mind. Whenever I used to imagine where I would live and raise a family, the imagined spot always had a great view. No matter where in the world I conjured up, the view would be the most important aspect of the property. The Bryan Bowers line, "The view from home will flat out melt your mind," captured what I wanted in a place to live. I bet I am not alone. If a nice view from home is something you value, this one, the one currently under discussion, if for sale. We are building another house with another great view from home just down the road from here. I figure I am interviewing neighbors when I show this house to prospective buyers; folks interested in the Adirondack lifestyle and real estate in the Adirondacks. If you are a regular reader of this blog, you will know we spend a lot of time doing things outdoors. The house is located on two acres of wooded property with x-c trails on our property that connect to the Olympic trails at Mount Van Hoevenberg and to the Jackrabbit Trail. 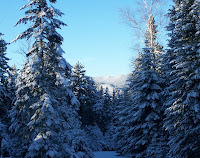 We are minutes from Whiteface Mountain and have great cycling out the door. So, it makes sense that our home is equipped for the outdoor enthusiast lifestyle. In the basement is a great ski tuning area and toy storage for things such as skis, bikes, paddles, etc., in addition to the standard work benches and laundry apparati. Although I didn't begin this blog to talk about selling my house, let me know if you are interested. And yes, natural beauty is good for the spirit and can flat out melt your mind.